Description Before he painted Romantic subjects drawn from classical, biblical, literary, and contemporary sources, Turner specialized in topographical views. This work, commissioned by the third earl of Darlington, is one of Turner's most successful "house portraits." It is also one of the first works in which he fully exploits the dramatic potential of the sky. 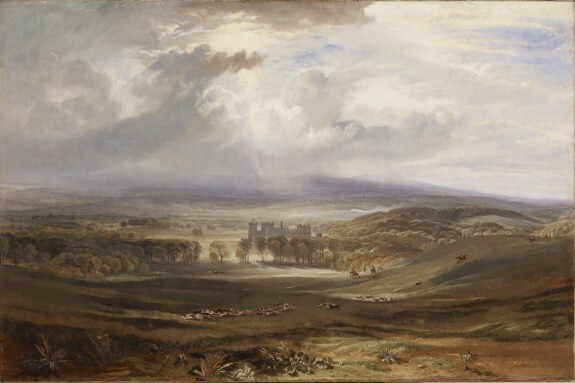 The earl, an avid sportsman who reportedly hunted six days a week, may have influenced Turner's rendering of the scene. When the painting was first exhibited at the Royal Academy in 1818, it included a mounted huntsman in the foreground. Turner subsequently painted over this figure after his work had been denounced as a "detestable fox-hunting scene." Raby Castle, a ca. 1380 structure, is located in County Durham, England. [Exhibition title unknown, held at the Royal Academy]. Royal Academy of Arts, London. 1818. [Exhibition title unknown, held at The French Gallery, London]. The French Gallery, London. 1899. [Exhibition title unknown, held at W. Scott and Sons, Montreal]. W. Scott and Sons, Montreal. 1899. J. M. W. Turner. National Gallery of Art, Washington; Dallas Museum of Art, Dallas; The Metropolitan Museum of Art, New York. 2007-2008. Provenance 3rd Earl of Darlington, 1817-1818, by commission; Widow of the Duke of Cleveland [date and mode of acquisition unknown]; Mssrs. Wallis, French Gallery, London, 1899, by purchase [from the widow of the Duke of Cleveland]; W. Scott and Sons (? ), Montreal, 1899 [exhibited there November, 1899]; Henry Walters, Baltimore, ca. 1899, by purchase; Walters Art Museum, 1931, by bequest.